A new dish has come into my life recently. I mean, it’s an old dish, maybe very old, and maybe you’ve been eating it for breakfast or dinner all your life, but I’ve only gotten to know it in recent years. And I’m a little obsessed. It’s called shakshuka. 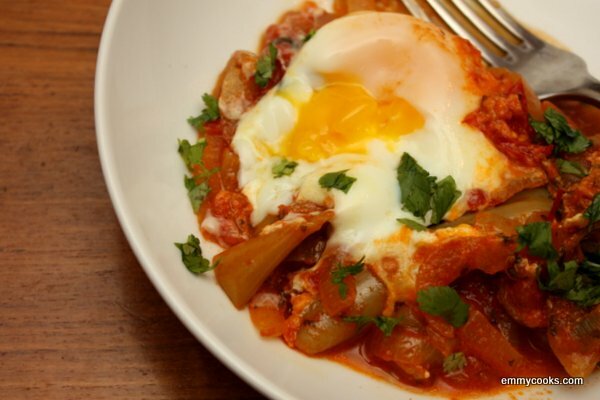 This entry was posted in Breakfast, Eggs, Food, Recipes, Sauces, Soups and tagged brunch, dinner, eat it anytime, peppers, shakshuka, stew, tomatoes, vegetarian recipe on October 8, 2012 by emmycooks.